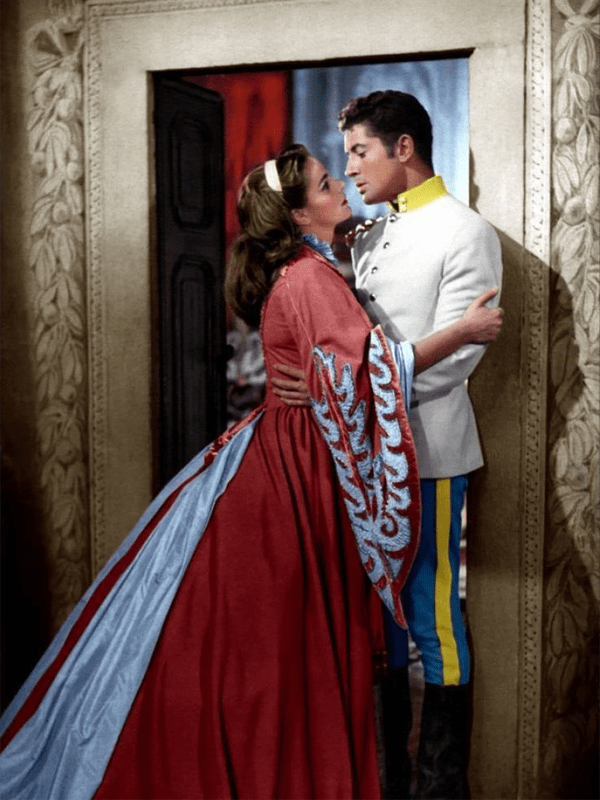 Admittedly, I haven’t seen many of the films that Piero Tosi designed costumes for. 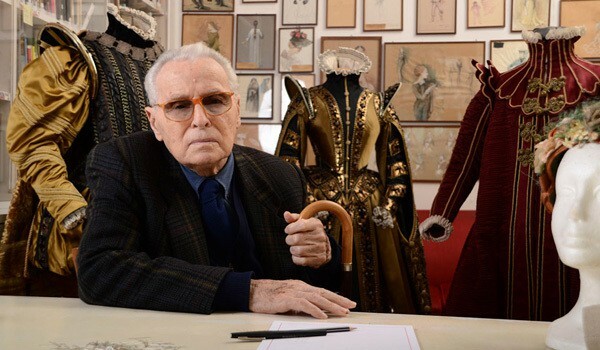 They’re all Italian, since he famously dislikes travel and has only worked in his native country even though he’s been working as a film costume designer since the 1950s. 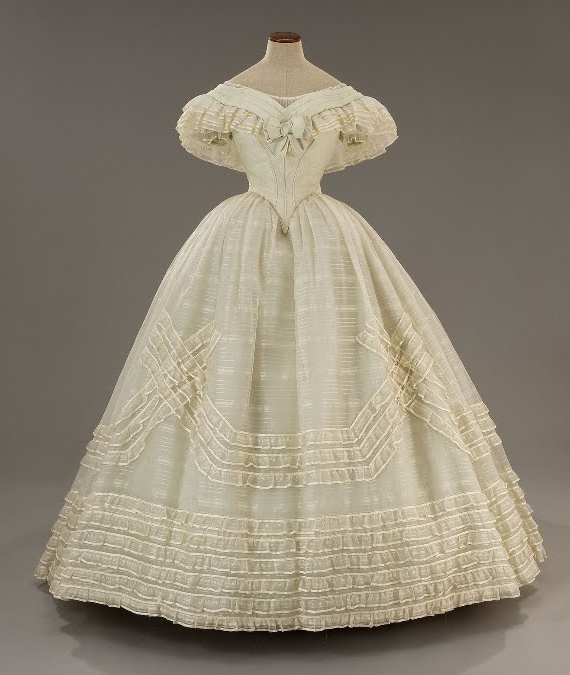 But images of his creations are everywhere, and they’re so exquisite, the costumes are often mislabeled as authentic historical garments, especially on Pinterest and Tumblr. You’ve probably seen his work without realizing it! 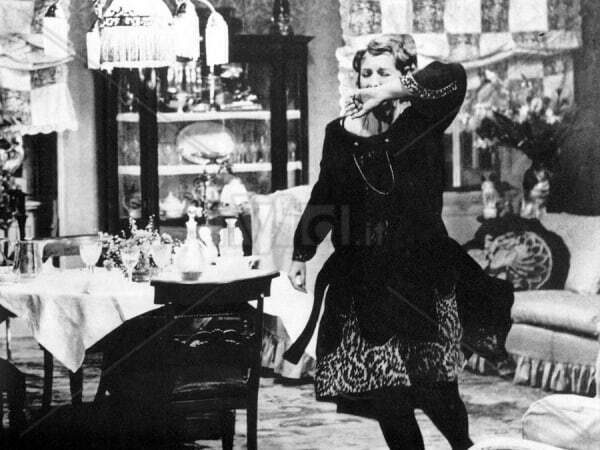 Early in his career, Piero Tosi began working with influential Italian director Luchino Visconti, who was part of the Neorealist movement in film. 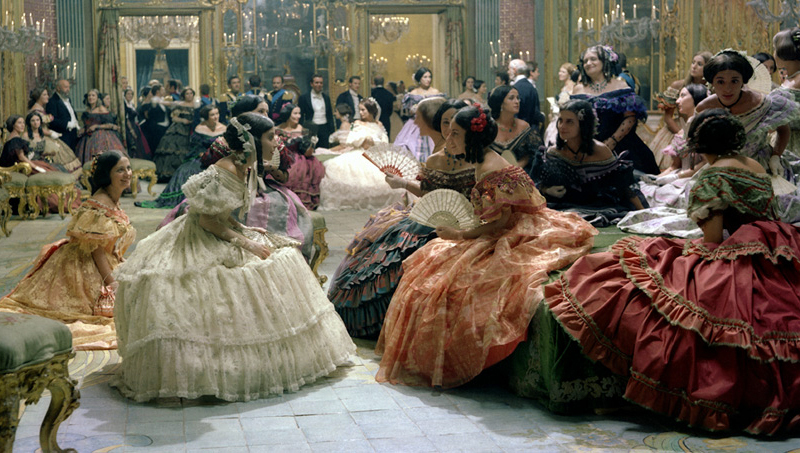 While movies made in that genre focused on the smaller-scale problems of the common people, the short-lived movement’s insistence on showing hyper-accurate locations, lighting, and how people looked carried over into the grand historical films Visconti began to make with Tosi as costume designer. 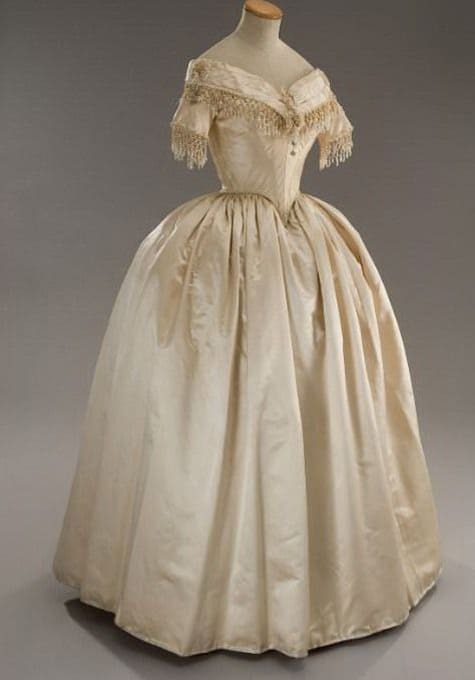 The director and costumer were like-minded in dressing actors in garments as close to historically true costumes from the skin out. Tosi soon enlisted the tailoring house run by Umberto Tirelli to accomplish these goals, beginning a lifelong collaboration between Piero Tosi and Tirelli Costumi. While Tosi hasn’t designed costumes for film in over a decade, he sometimes works in theater and opera while teaching in Italy. 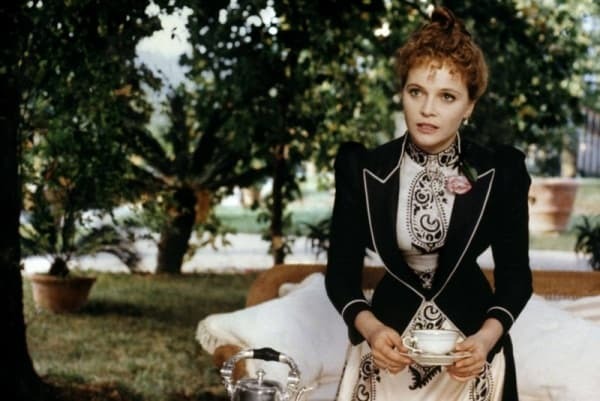 Also his influence continues today through his proteges such as costume designers Milena Canonero (Out of Africa, Marie Antoinette), Maurizio Millenotti (Immortal Beloved, The Happy Prince), and Gabriella Pescucci (The Age of Innocence, The Borgias). 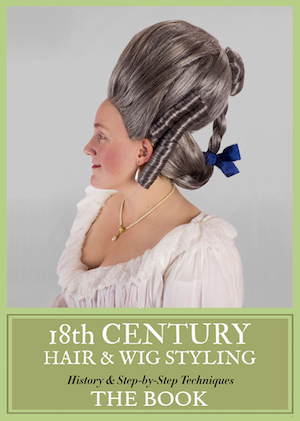 Let’s enjoy some of Piero Tosi’s fantastic historical costume work! 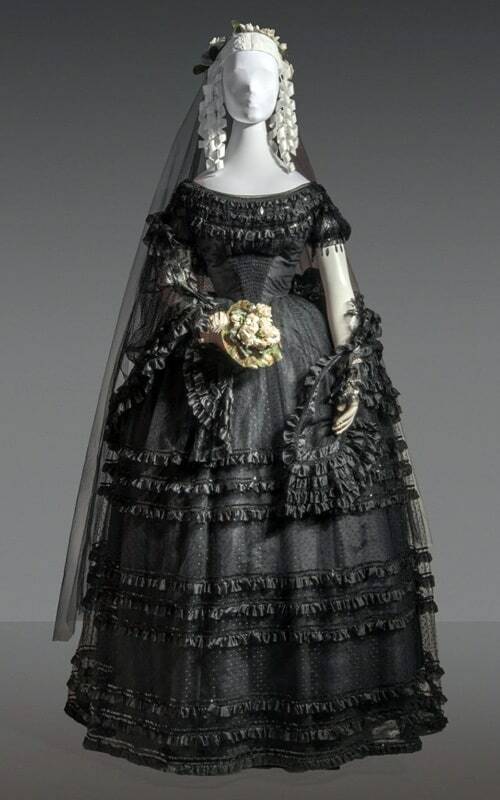 Set around 1866 during the Italian-Austrian war of unification. Alida Valli plays an unhappily married countess, Rina Morelli is her lady’s maid. 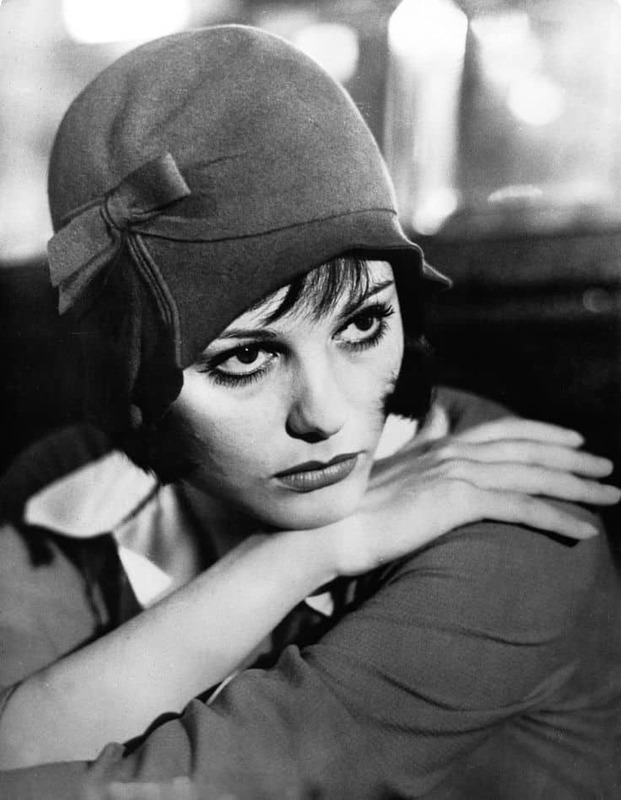 Claudia Cardinale as the ingenue … maybe. 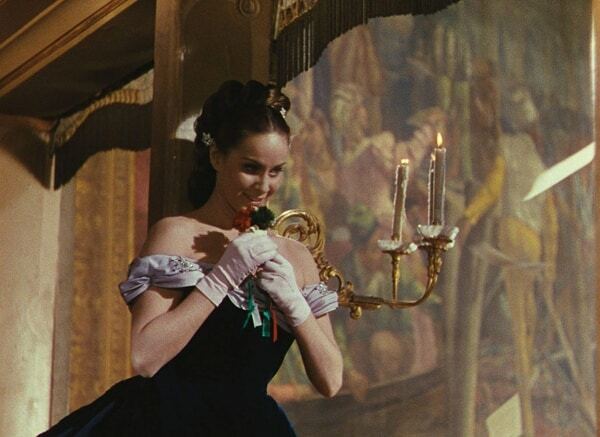 The ball scene is filled with gorgeousness. 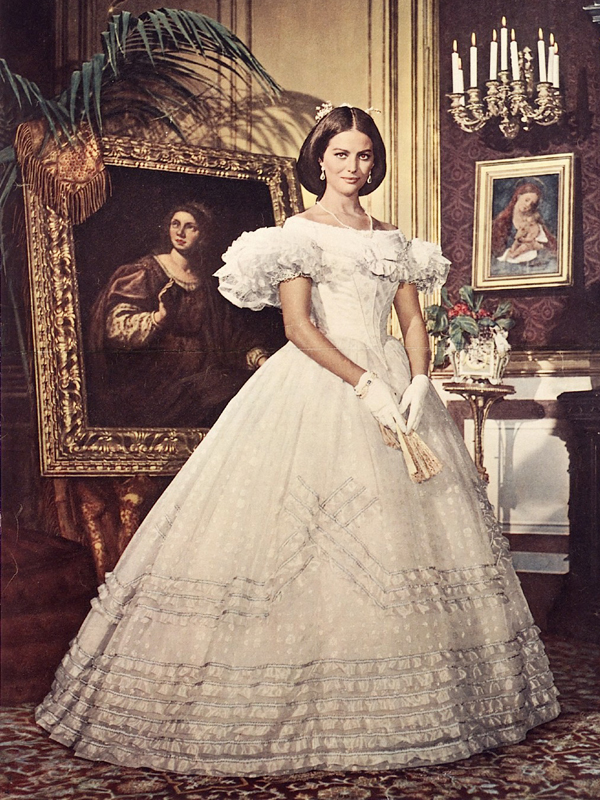 Reportedly, Claudia Cardinale was tightly corseted down from a natural waist measurement of 68cm to 53-54cm and had bruises after a month’s filming. 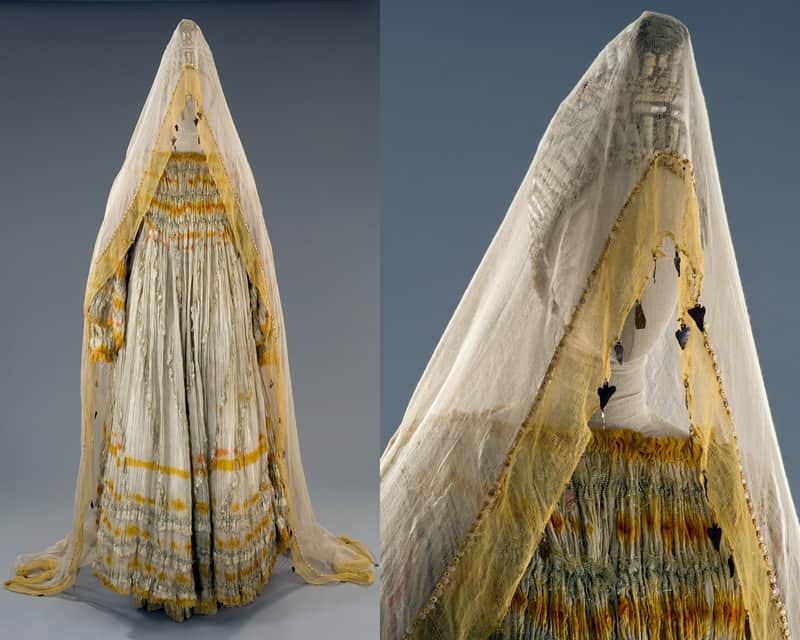 The 12 layers of organza for the original gown were provided by Dior. This is actually a exact reproduction made by Tirelli Costumi for display because the movie costume didn’t survive long after filming. 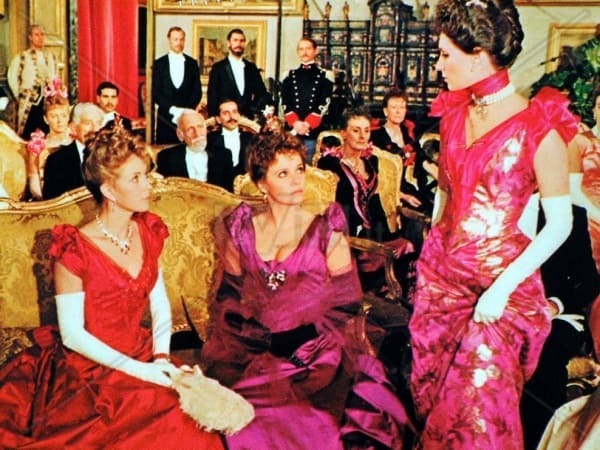 Charlotte Rampling as the matriarch of a wealthy German family that does business with the Nazis in the 1930s. 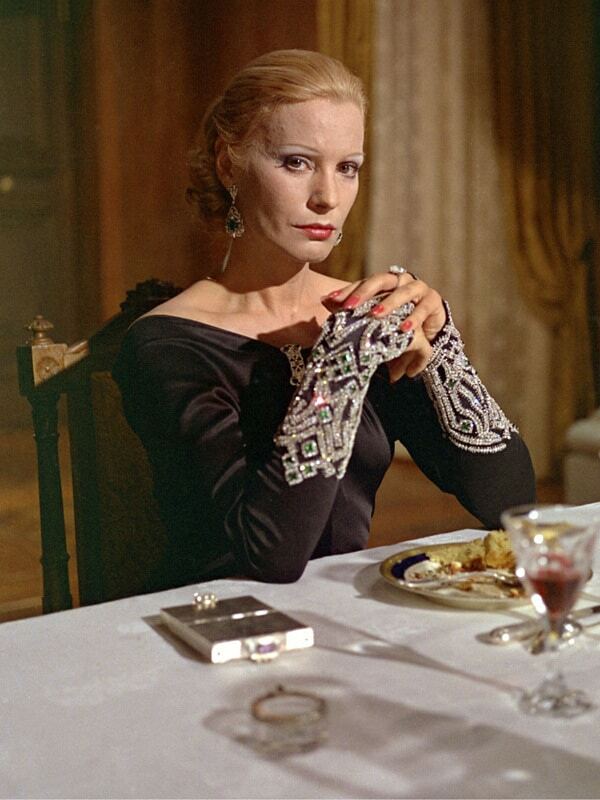 Ingrid Thulin is matriarch of another branch of the family. 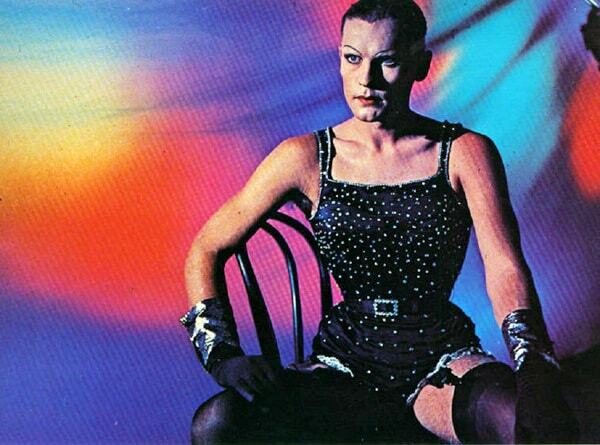 Helmut Berger is the deviant heir of the family fortunes who collaborates with the Nazis. 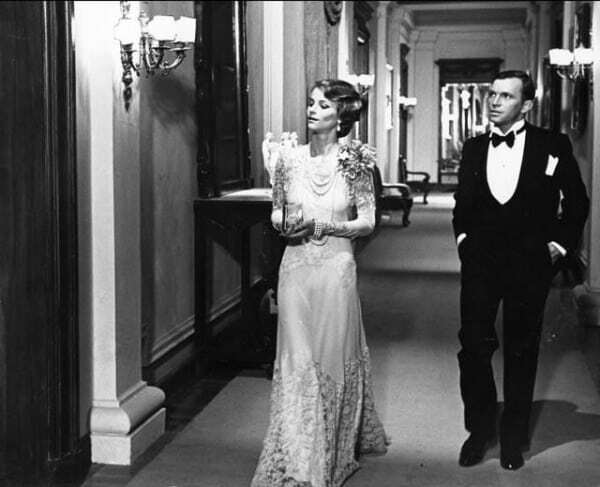 The 1930s costumes in this film were seen as a contemporary fashion influence, according to trade magazine, Women’s Wear Daily. 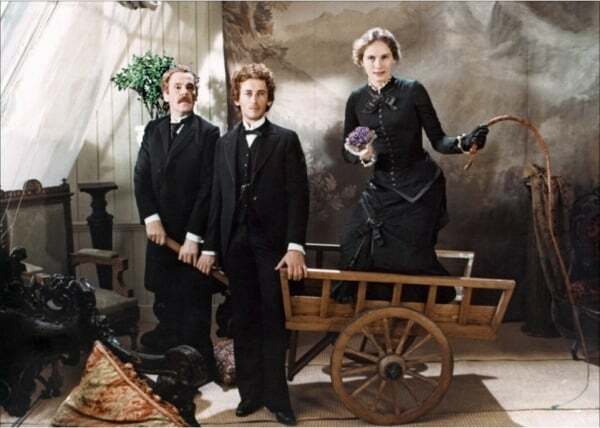 Based on the Thomas Mann novel and set in the 1910s, this film’s costumes are exquisite historical reproductions. Some of the white suits worn by Silvana Mangano (although not this one) were actual antique garments and vintage textiles were used when possible. 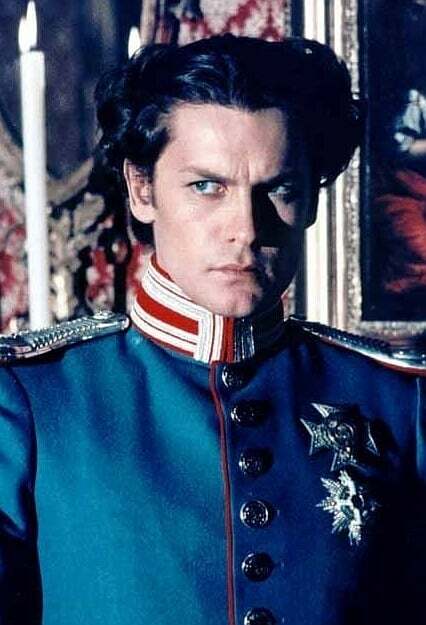 Helmut Berger stars as King Ludwig II of Bavaria from age 18 till the king’s death. 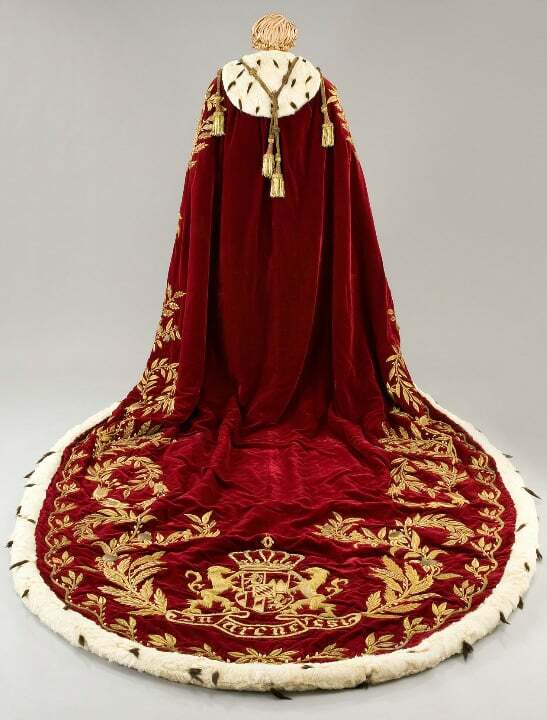 Of course, there’s some magnificent coronation robes. 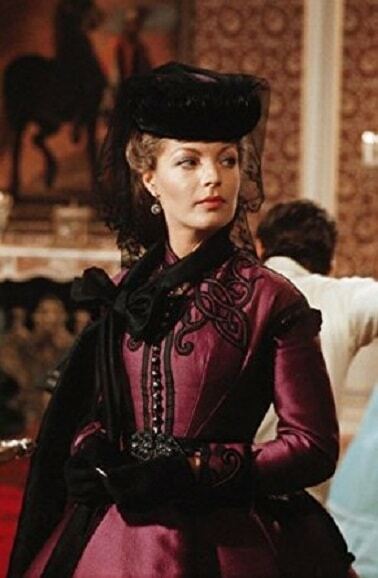 Romy Schneider reprises her role as Empress Elisabeth of Austria from the Sissi films to play Ludwig’s cousin. 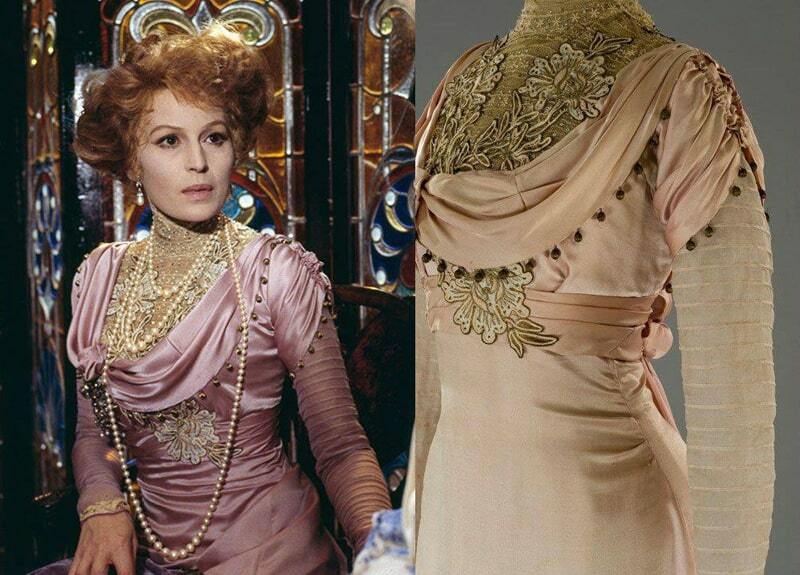 On screen, this gown worn by Schneider appears more red; not sure if that’s due to lighting or the actual costume has faded. Likewise, this ensemble appears reddish. 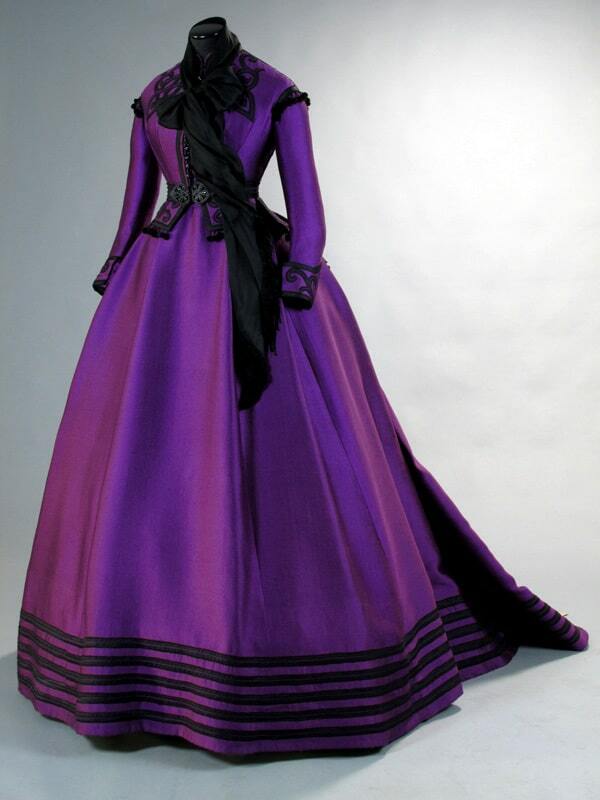 But is brilliant purple on display (it appears the same; note the embroidery and trims). OK, so sometimes no costume IS a costume. 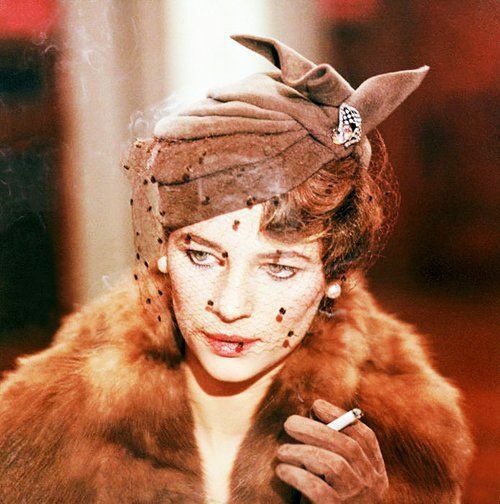 Piero Tosi created this iconic look for Charlotte Rampling in this 1950s-set Nazisploitation film. Who says red and pink don’t go together? 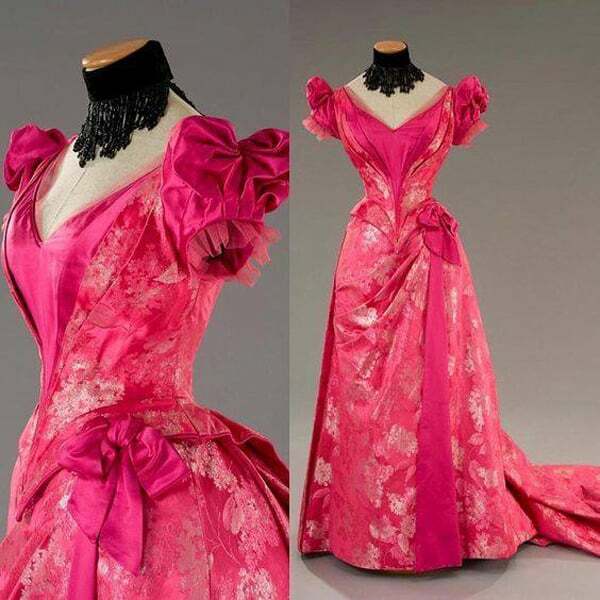 One of the gowns on display at Tirelli Costumi. 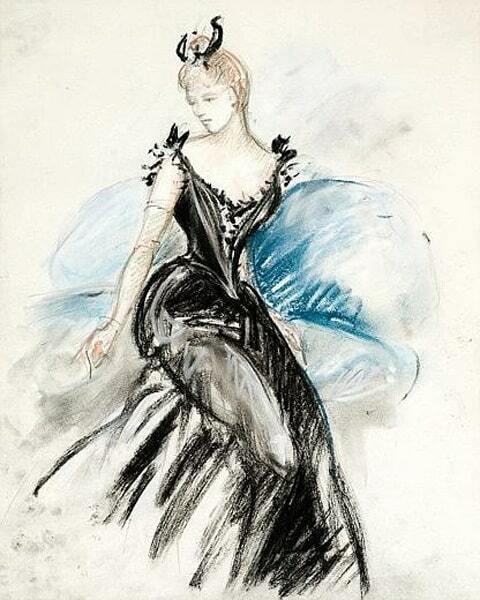 Tosi’s sketch for a black ballgown in the same vein. Set in the 1880s, the film is about the “intense friendship” between 1880s between philosopher Friedrich Nietzsche (Erland Josephson), psychoanalyst Lou Salomé (Dominique Sanda), and author Paul Rée (Robert Powell). 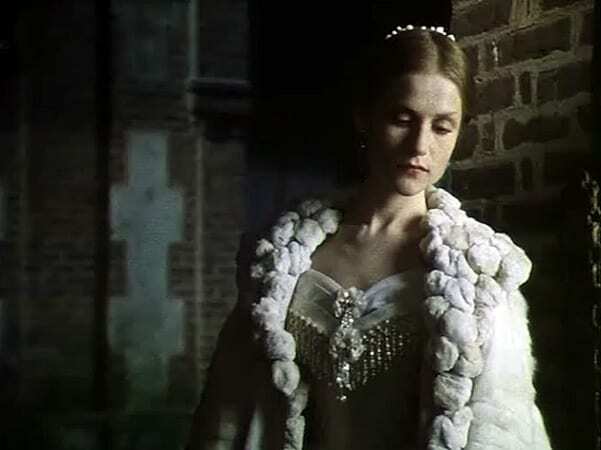 Isabelle Huppert portrays the real courtesan Alphonsine Plessis, inspiration for a novel by Alexander Dumas. One of the costumes on display and in the film. 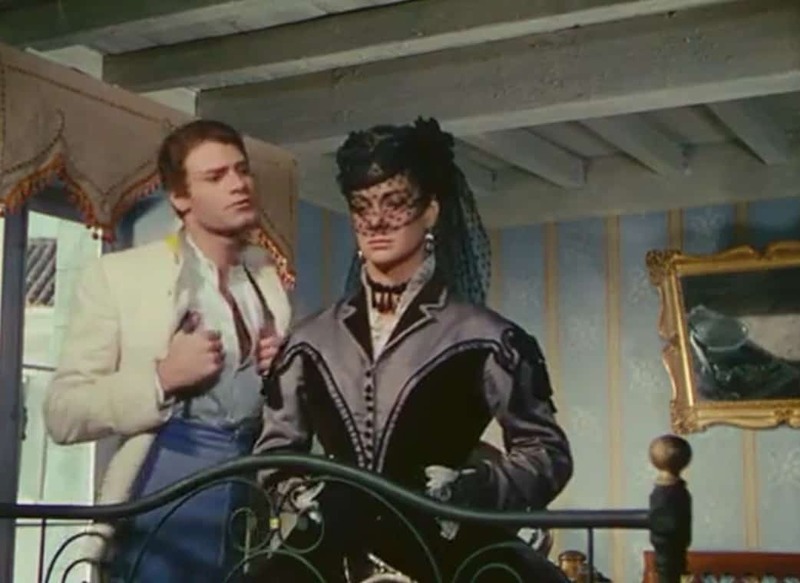 A film version of the opera, with soprano Teresa Stratas. 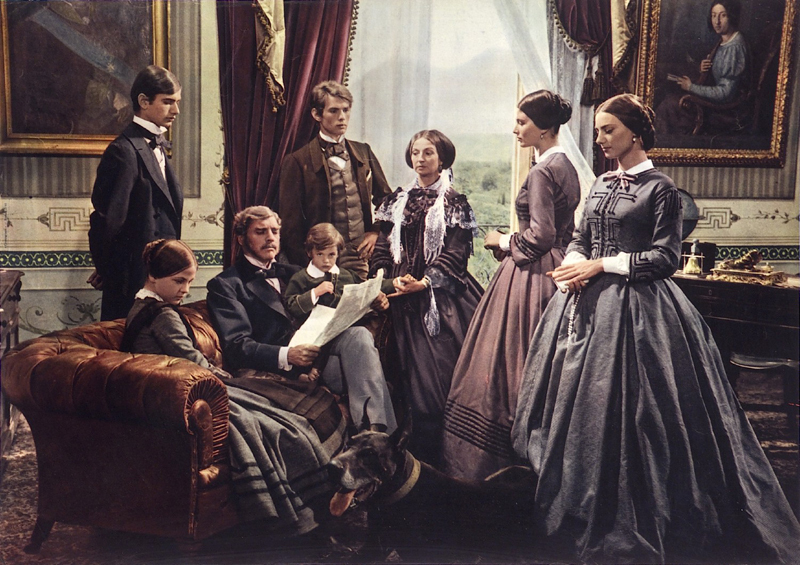 Set in the 1850s in Sicily. 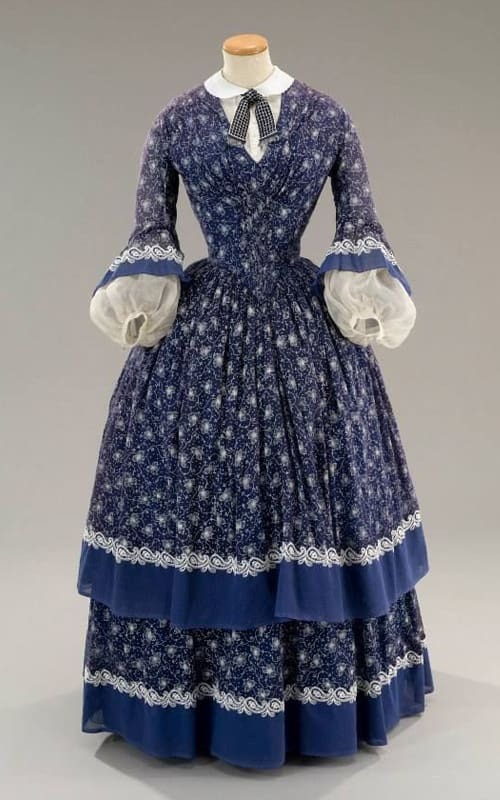 One of the typical print gowns. 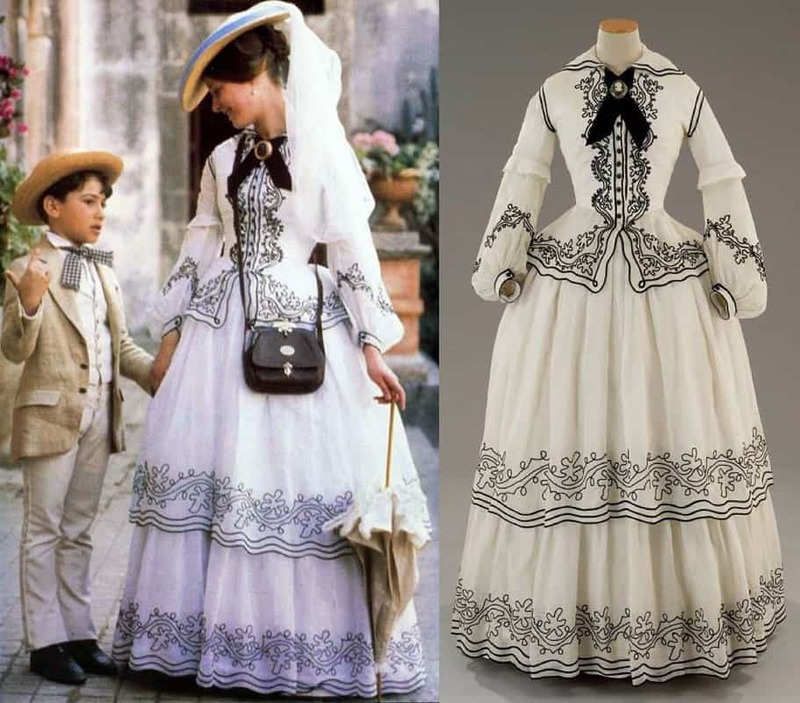 This white dress, worn by Mia Fothergill in the film, is often shown online as an authentic period gown, but it was designed by Piero Tosi and made by Tirelli Costumi. What’s your favorite historical movie costume designed by Piero Tosi? And those are all magnificent. See, Hollywood, that’s what doing your homework and acting on it looks like. I blame Kendra for that typo! Tosi has been adamant that the costume includes the head-to-toe, skin-out look, especially for historical fashions. Details matter! it shows! can we, like, make an award and send it to him? 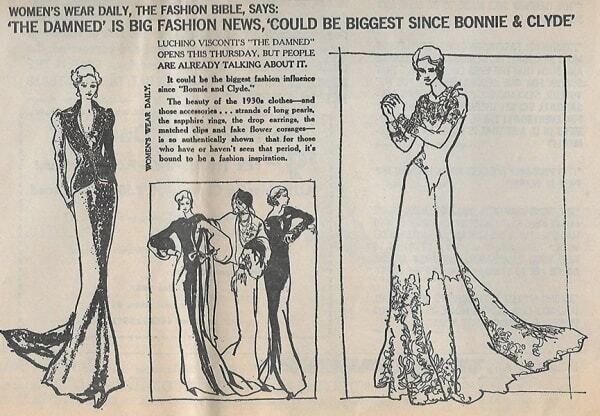 and other worthy designers? I mean, these are just fantastic. 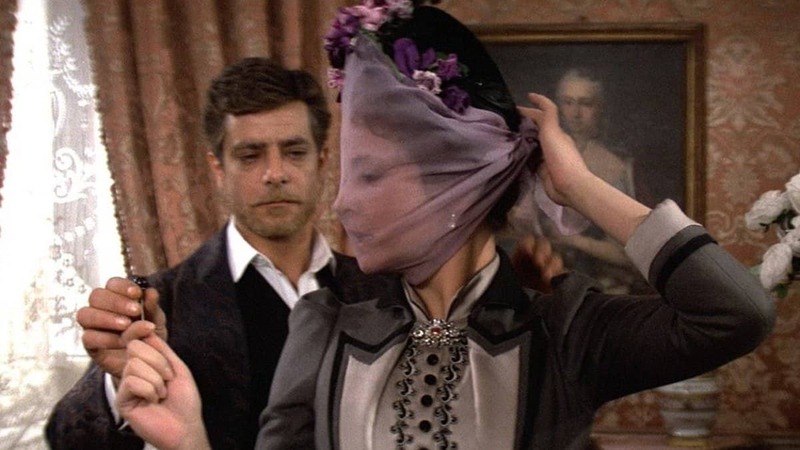 Marcel Escoffier actually designed Alida Valli’s costumes in Senso, which is why they look more “Hollywood leading lady” than all the others which were designed by Tosi. 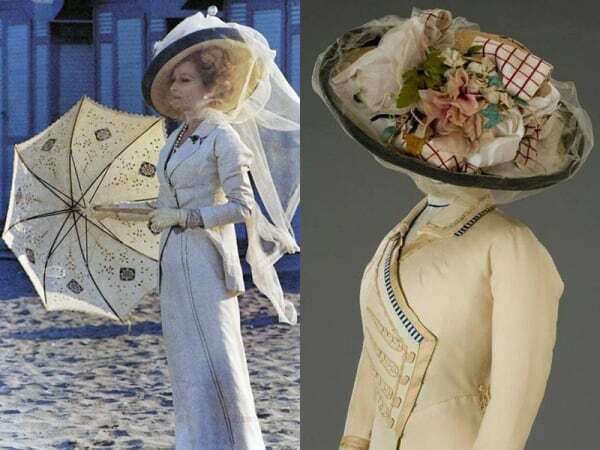 Are the costumes in the first two pictures of Tosi designed by him for the theatre? 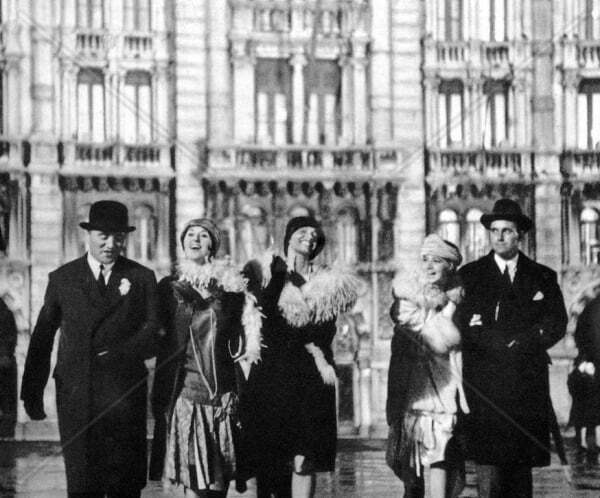 Do you know what production they were for? They (as all of these) are incredible! I believe Medea with Ms Callas was at the La Scala. 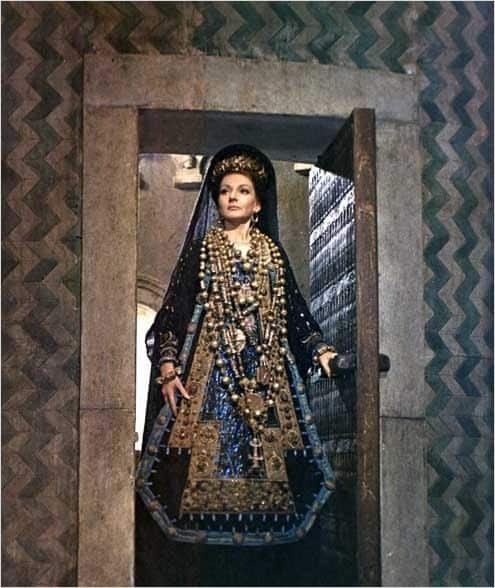 No, this was Pier Paolo Pasolini’s 1969 film “Medea,” which was Callas’ only film. 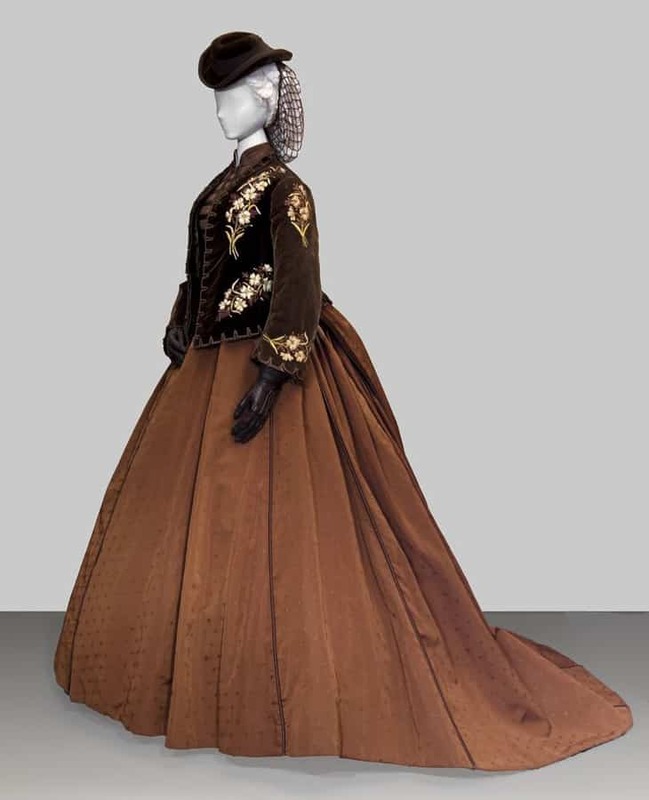 Piero Cicoletti and Gabriella Pescucci worked on the costumes as well. It’s on YouTube in an English-dubbed version. 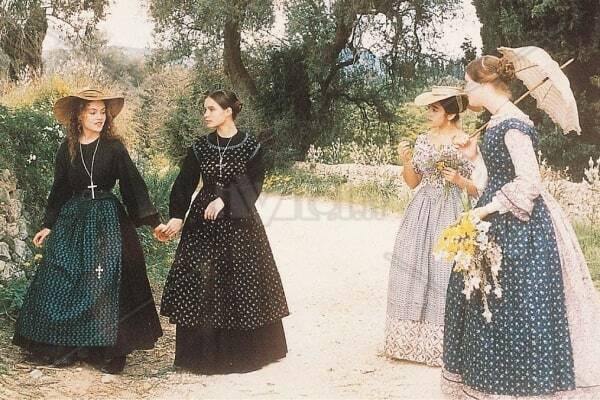 My favourites of Piero Tosi costumes are Il Gattopardo, Ludwig and L’Innocente. But all are so incredibly awe inspiring that I’m literally kneeling in adoration. 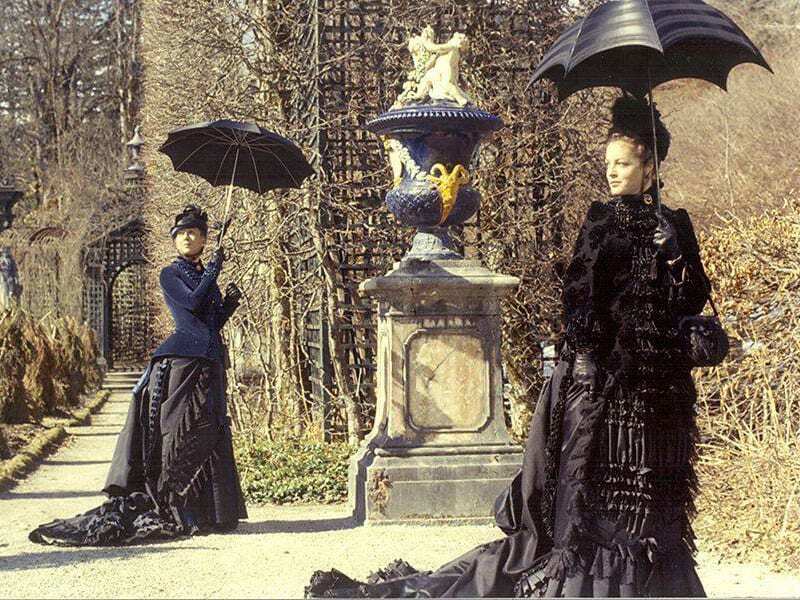 He is the benchmark for costume designers as Mr Tosi dresses his actors including the extras from head to toe. They look right bc of this. The Leopard is hands down one of the most gorgeous films ever. 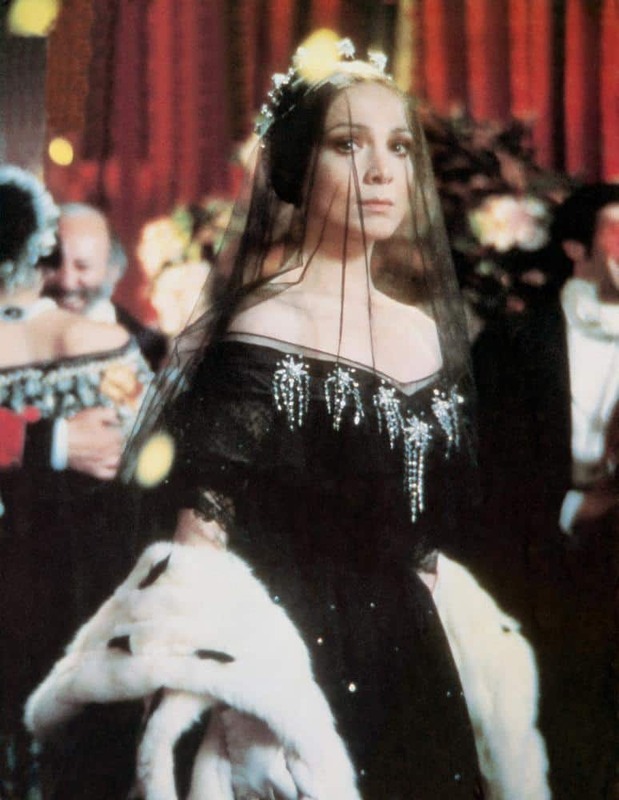 I think Coppola pulled a lot from it for The Godfather. I read in a book on clothing through the ages, about the film “The Leopard”, that some of the shots were composed so the people were arranged like they appear in contemporary paintings of that era. They really tried with the verisimilitude of that film. I was surprised how much I liked it, and I still remember it though I saw it many years ago. I was just entranced by watching it. 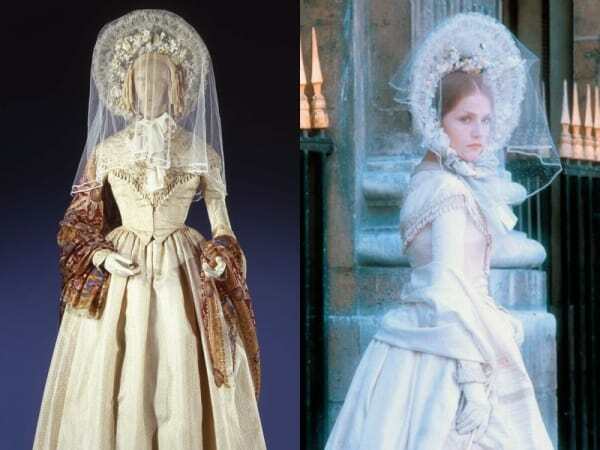 I’ve actually seen a lot of thee films and remember the costumes fondly. I think my favorite is Ludwig. I’m so glad there is a designer out there who believes in head-to-foot design. 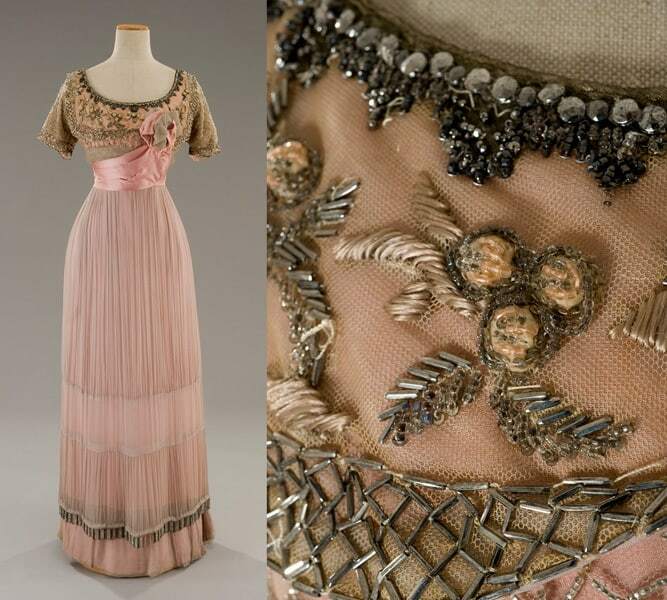 Thank you for this look at Piero Tosi’s magnificent work. 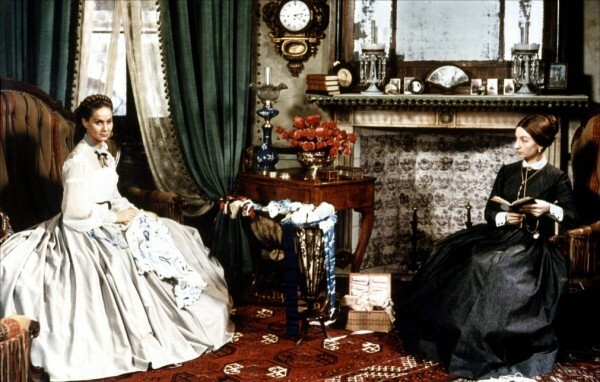 I saw a number of these films in the theater back at the time, and it was nice revisiting them. I wish the male costumes in Il Gattopardo had received more coverage. Burt Lancaster as the patriarch had it all — the clothes, the posture, the hair. 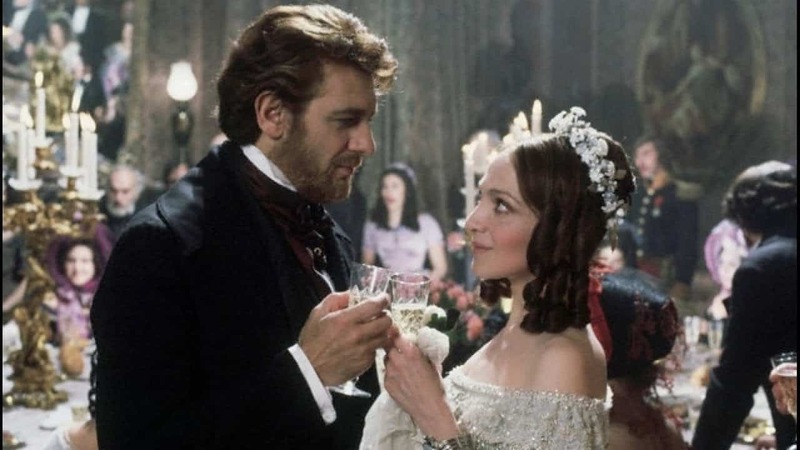 His character spoke so little during the performance (good thing as he was dubbed), yet his look, especially at the ball scene, conveyed so much emotion. 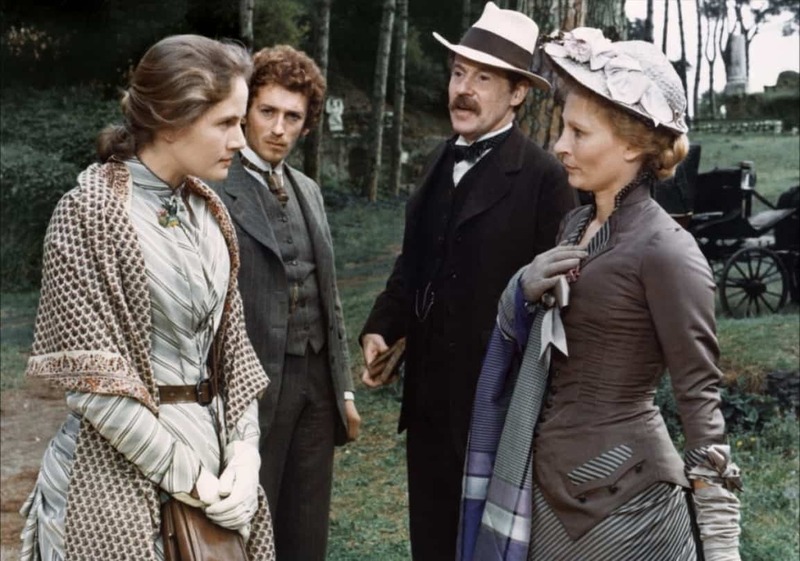 One of my favorites, and it’s a hoot on the DVD extras to hear the director Sydney Pollack basically drool over Lancaster’s dressed by Tosi.